When it comes to choose the perfect new fence, you have A LOT of options to choose from: vinyl, wood, chain link, aluminum, and son and so forth. Fortunately, choosing your fencing company shouldn’t be a tough decision. Choose Hercules Fence of Manassas, Virginia. We are the largest fence company based in Northern Virginia, affording us the luxury of purchasing the fence you want at a price you will love. Click Here to request a quote today (we will help you pick the right fence)! As a homeowner, few things matter more to you than money. Everything costs money. And when it comes time for you to sell your home, you want to get as much for your house as you can. Fortunately, a new wood fence can help with just that. 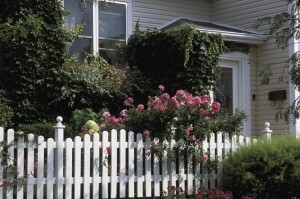 With a return on investment of roughly 50%, according to Remodeling Magazine’s Annual Cost vs. Value Report, a fence is an excellent investment. And when you consider the impact it has on the curb appeal of your home and how that can influence potential homebuyers, the decision is simple. According to neighborhoodscout.com, there are approximately 176,985 property crimes annually in Virginia. Property crime includes, among other crimes, burglary, larceny, theft, motor vehicle theft, arson, shoplifting, and vandalism. Manassas homeowners, in particular, have a 1 in 44 chance of becoming a victim of property crime. So you have to ask yourself a very important question; “Is my home well-protected?” A new fence can help. For more than 50 years, Hercules Fence has been providing exceptional fence services to the people of Northern Virginia and the surrounding area. During this time, we developed a strong reputation for professional service and quality installation. Why would you trust anyone else with your Wood Fence Installation? Please contact Hercules Fence of Manassas, Virginia by calling (703) 551-2609 or visiting our website. You can also follow Hercules Fence on Facebook, Twitter, Google+ and YouTube! This entry was posted on Friday, August 22nd, 2014 at 2:45 pm. Both comments and pings are currently closed.